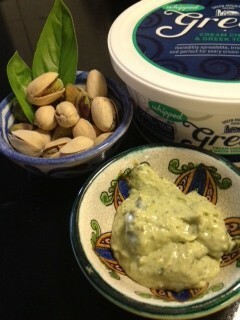 Years ago I remember seeing Alton Brown make a pistachio pesto and it sounded so delicious! I love pistachios and have always kept that in the back of my mind. So recently I made some. Wow is it delicious!! You really can taste the pistachios but they don’t over-power the basil or parmesan (and if you’re a regular reader you know how I love my parmesan. Hell, if this is the first time you’re ever reading this let it be known-I love parmesan) I made quite a bit and froze 2 tbsp amounts wrapped in plastic for use whenever I want it. Enjoy!! The packet stuff is ok but I made my own. Adjust to your own taste and use as much or as little as you’d like. This makes enough to use to season 2 lbs. of meat.